What are the socio-economic variables that shape resilience to climate change in informal settlements? Key takeaways from the release our report in New Delhi. 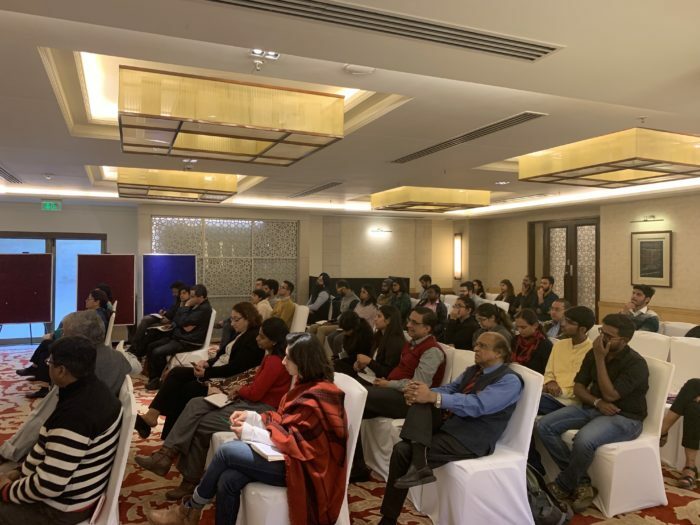 Tandem Research and The Asia Foundation partnered to generate policy insights for building resilience among the most vulnerable urban communities in India. Our research was presented on Wednesday, March 06, by Dr. Vikrom Mathur, as followed by a panel moderated Dr. Urvashi Aneja. Three panelists — Dr. Umamaheshwaran Rajasekar, Dr. Divya Sharma and Mihir Sharma — joined the initiative at the India Habitat Centre venue to share their insights on climate change impacts in Indian informal settlements. Among the panel was Dr. Umamaheshwaran Rajasekar, the chair of Urban Resilience at the National Institute of Urban Affairs. Having widely worked in developing systems for society and institutions to prepare, manage and adapt to changing environment conditions, Dr. Mahesh was asked to provide insight into how we can support community-based resilience in Indian cities, particularly through participatory frameworks that enable engagement with government processes. He first explicated the logic of contextual resilience: a situation for the fishermen community in Goa, for instance, may not be the same elsewhere, even if there is a similar threat or natural disaster. A key difference is around livelihoods, the means of making a living. A coastal community in Panaji would maneuver within a certain set of capabilities and actions “required to secure the necessities of life” which would manifest differently in a river community in Agra, for example. Both regions are at risk of flooding, but how each community is able to confront this based on their experience and resources may vary drastically. Another key factor to resilience is in terms of how a community functions in regards to culture, social networks, and state government policies. At the most local level, communities have unique interpretations of their own vulnerability and capacity; the lens from which an individual experiences disaster is first and foremost defined by their culture. A level above this considers the social networks within and outside of a community, taking the form of local authorities, municipal governments, and urban stakeholders. These bodies have an actionable power in the design and implementation of resilience methods. Though, it is state governments that have the most jurisdiction over infrastructure and management of resources — political and financial decisions about public health and sanitation, infrastructure, land and water management fall heavily onto top-tier institutions that govern multiple communities at a time. Dr. Mahesh proposed a framework to support citizens, beginning with a detailed map of the community’s situation i.e. a layout of resources and assets. Along these lines, a “list of actions” is needed— actions which are identified per city, community, even culture. From here, actions can be translated into a clear intervention with actionable points which NGOs and city administrative bodies can then adopt. Dr. Mahesh pointed back to the key challenge of shaping government processes — “much has been written in terms of policies and guidelines, but it’s the enforcement” of such policies at a community level intervention that has yet to be streamlined. The second panelist Dr. Divya Sharma — Urban Planning and Policy Lead of Oxford Policy Management — was asked to share insight on governance frameworks, policies, and institutions needed to support climate resilience, especially among the urban poor. As an urban policy expert, Dr. Sharma has much experience in formulating city strategies and policies for smart cities, climate and disaster resilience and pro-poor development. She began with the approach of defining “resilience” — where does one start? With the “eye of an urban planner,” resilience can be understood in two ways. First, there is resilience in terms of slow onset change which will not show force, but will “definitely change the way we live and make lifestyle choices.” Second, there is resilience in terms of extreme events, which are considered a “different ball game, with different connection and integration points.” Starting with these two differentiations, resilience in a city refers to dealing with microclimate, as well as macroclimate changes. Dr. Sharma made it clear that no matter the design load requirements, city systems must be built to foster the maximum amount of resilience in a community. Further, access to city systems calls for a much more inclusive approach. The informal sector is essentially ignored; their contributions to the economy is not even recognized. In order to build resilience for informal settlements, they must first be seen, heard, and given equal, if not more importance as they inhabit the areas that will face the most intense climate change impacts. This can be demonstrated through social protection and safety nets built into these communities. Moreover, livability should be ensured through alternative livelihoods, as to match changing soil conditions and rainfall patterns, for example. The third panelist Mihir Sharma — Senior Fellow at Observer Research Foundation— is a trained economist and political journalist, and is currently the India columnist for Bloomberg View. He gave his insight into the financing of urban resilience, deliberating to what extent private capital and finance can play, particularly at the city and municipal levels. “Municipalities are in a spot of trouble.” Cities depend on money from the outside, thus, for urban local bodies, only 20-30% of what they spend is from their own revenue. Many local forms of financial generation for cities has been taken away and subsumed into the Goods and Services Tax (GST). “The first thing that needs to be considered in this conversation is the political feasibility” of supporting municipal councils. As the determining party, local urban bodies should be given their fair share of taxes at every level — but this does not align with the reality of GST and grant structures. The gap in financial assistance between cities is large — if you compare how much money goes to cities in terms of grants, you can see a “2-3 fold difference between a city and the next larger city in the same state.” Mihir stressed that those who seek to influence governance should first understand how politics work. In addition to the panelists, Ms. Nandita Baruah — India representative for The Asia Foundation — posed an interesting thought about resilience. Do communities in informal settlements have aspirations or desire to live beyond subsistence, or is it simply about getting by? This speaks to the larger issue of climate resilience paradigms that focus on doomsday scenarios — an arguably privileged framing of climate change — or that propose grand infrastructural schemes that exclude, and oftentimes push out those in informal settlements and temporary households. A final thought to come out of this event is the fact that there is no usable, regional translation for the word “climate change”. Day-to-day changes can be seen and felt most by the socially vulnerable, yet there lacks crucial vocabulary to express the social vulnerabilities they face. In the initiative to build the capacities of the urban poor, there must be a simultaneous grassroots campaign for intra-community awareness, else resilience remains in the hands of stakeholders.